I'm planning on making another ghost child. 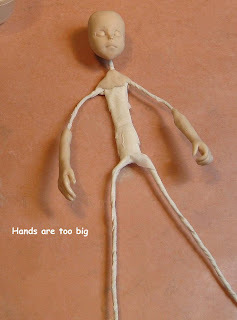 The armatures for these sculpts are quite simple as there is not a lot of 'flesh' on them. piece will be holding something. I see in looking at this pic that the hands are too big (this is a prob I have - hands usually go through several reductions before they are the correct size. As this piece is now, only the head has been cured.